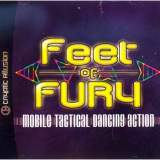 Feet of Fury © 2003 GOAT Store Publishing. This is a CD-ROM based product and might not be compatible with some Dreamcast consoles manufactured after October 2000. Released on June 7, 2003.